Health records are the building blocks for providing valuable and meticulous healthcare services. High quality patient care can be provided with the help of vital information available in both traditional as well as digital formats. With the increase in number of patients, health information management programs and software are in demand today so as to provide accurate, real-time information to patients, doctors, and other related healthcare professionals. By outsourcing your health information management system requirements to Outsource2india, you get assistance in meeting your healthcare information management needs in a hassle-free manner, without facing the chores of selecting, maintaining, and accommodating health information management program staff in house. We help to manage a large amount of data that was earlier being maintained by medical records departments in healthcare institutions and hospitals, comprising data about inpatient and outpatient services. Our services enable faster and more efficient management of health information, compliant with all mandatory regulatory requirements. At O2I, we understand the importance of healthcare information management outsourcing for both managers and medical professionals who need to keep abreast with real-time information of patient details. Over the years, we have helped in the successful adoption of high-quality healthcare management services by linking clinical documentation, coding, CDI, compliance, and quality for global healthcare providers, while ensuring their ROI never takes a hit. Our end-to-end approach towards RCM helps to increase cash flow, reduce A/R periods, and achieve increased operational efficiency for healthcare and clinical care providers. We help to analyze the losses suffered, the gaps in service, and the delays suffered by your operation, and use technology-driven solutions to provide customized solutions which help you achieve your business goals. We provide comprehensive advisory solutions for RCM process improvement, accounts receivable services, managed care recovery services for collections, and detailed inventory management and business intelligence services as part of our RCM services. 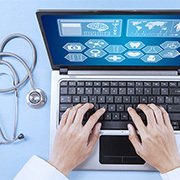 As more and more healthcare and clinical service providers face document processing challenges, we provide custom solutions which work through a unique combination of next-gen platform tools and fuzzy logic. Our services transcend mere document capture and archival functions, as we help you with intelligent AI-based interpretation, automating complete document lifecycles, and high-tech business information routing systems which ensure the right information reached the right person at the right time. We can process everything from handwritten, bar-coded, check-marked, and typewritten documents while remaining 100% error-free. We provide both on-site and remote medical coding services which support multi-pronged activities such as information distribution / release, scanning and registry, etc. Our medical software used for coding is HIPAA compliant, and we have expertise in all hospital and physician coding types such as CPT and HCPCS coding. Our staff credentials include certifications from RHIT, RHIA, CCS-P, etc. Our services help to streamline your coding practices, resulting in an improved revenue stream and improved CMI while reducing your DNFB/HARA levels. Our medical auditing services are aimed at properly identifying the strengths and weaknesses of your clinical documentation, coding, and billings so as to optimize the reimbursement practices. We comply with all regulations, and our auditors have AHIMA credentials for high quality IM internal audits, APC audits, MS-DRG validation audit, and ICD-10 review. As the healthcare sector becomes increasingly technology dependent, we help healthcare providers by integrating high-quality IT services with existing hospital management software, drug safety, diagnostics technology, clinical development, etc. Our IT services can help you optimize administration tasks and overall management, while maintaining safety and regulatory compliance. Our IT support services include network and link management, vendor management, service level management, database monitoring, exchange management, etc. Our team comprises of healthcare and analytics professionals with health information management certification. They are skilled in supervising the digitization of medical records and patient data. Properly designed and suitably implemented, our medical information management system services are effective in diagnosing and addressing issues with innovative solutions. We focus on management of healthcare data in a secure manner, helping medical facilities focus on important tasks to deliver better health care. We customize our medical information management services to suit your unique requirements. Leverage Outsource2india's Healthcare Expertise for Exceptional Operational Benefits! At O2I, we have extensive experience in providing value-added healthcare BPO services to a variety of healthcare providers, hospitals, clinics, etc. We are driven by quality and commitment to all regulations, thereby ensuring overall process improvement and client satisfaction. If you are managing large volumes of patient and medical data and are having trouble handling sensitive health information, then outsource your health information management requirements to us now! Contact us to outsource healthcare information management services.